Advocacy for Oromia warmly invite you to join us in celebrating this year’s Oromo Martyrs Day. 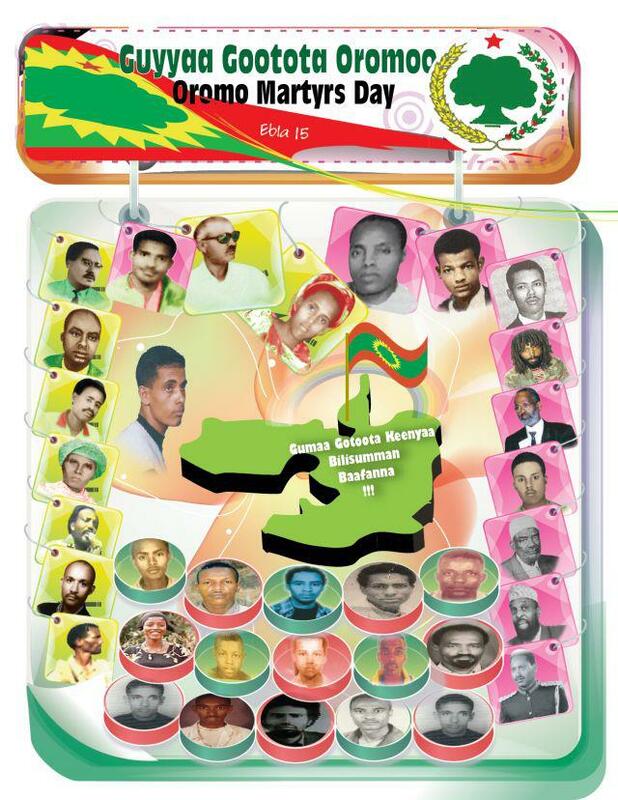 To welcome the the Oromo Martyrs Day, Oromias will be hosting different memorial ceremony at their places. Guest speakers will share their experiences. This is a perfect opportunity to network with friends and colleagues and support the work of the Oromo Liberation Front in promoting Oromo freedom struggle. April 15th is Oromo Martyrs Day also known as Guyyaa Gootota Oromo. This commemorative day was first started by Oromo Liberation Front (OLF) following the execution of its prominent leader’s on diplomatic mission enrouted to Somalia on April 15, 1980. Since then this day was observed as Oromo Martyrs Day by Oromo nationals around the world to honor those who have sacrificed their lives to free Oromia and to renew a commitment to the cause for which they have died. Mid 1978-1979 is remembered as the period when the survival of the Oromo national liberation struggle led by the Oromo Liberation Army (OLA) was under severe threat of extinction. It was feared that OLA units in Arsi, Bale, and Hararghe would disintegrate and their channel of connection and supplies would be cut off by the Dergue army that just recuperated from the Ethio-Somalia war. Upon defeating the Siad Barre army, the Dergue turned its face on OLA. The OLA in the fronts of Arsi, Bale, and Hararghe fought steadfastly and scored victory over the Dergue army and regrouped once again in January 1st 1980. In the wake of their military victory, OLF intensified its political struggle inside the country and abroad. The initial political victory includes the persuasion of the Siad Barre government to allow the opening of OLF office in Moqaddisho, Somalia in 1980, to serve as a center of consultation and deliberation between OLF political and military leaders. In the same year, a ten member high-ranking military delegates* were on their way to Somalia to meet with political leaders there when they were captured by Somali bandits in Shinniga desert (in Ogaden). These bandits were members of a splinter group from the Siad Barre army that harbored bitter hatred towards Oromo and OLF. These bandits abused and severely tortured their Oromo captives; they were strip naked in the desert with their hands tied behind their backs. The bandits finally ordered the Muslims and Christians to segregate before their execution. These Oromo comrades chose to stay together and face any eventualities than identifying themselves as nothing else but Oromo. On the day of April 15, 1980 all the ten were executed and their bodies thrown in a single grave.